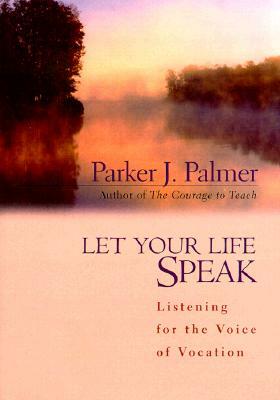 Let Your Life Speak: Listening to the Voice of Vocation by Parker Palmer, Jossey-Bass, 2000, 117 pp. This has been one of my favorite books on one of my favorite topics since I first discovered it and read it ten years ago. There are very few books that I reread over and over, and this is one of them. There are even fewer books that I refuse to lend out to anyone, because I always want to have them around for reference. This is also one of those books. I recently reread it again, cover-to-cover, in preparation for a retreat with other pastors forming a new long-term group for professional development in mid-career. As always, the book offered new insights and renewed depth to my thoughts on my own vocation. Palmer speaks with great wisdom about the time it takes to become yourself (a phrase borrowed from a May Sarton poem); about how closing doors and missed opportunities shape our lives as much as possibilities and openings; about the fundamental “birthright gifts” each person has for vocation; and about setting limits and caring for self as stewardship of our gifts. He even has a chapter on leadership, where he talks about the importance of spiritual depth and introspection to leadership. His final chapter uses the metaphor of seasons to understand the cycles of vocation throughout our lives. As I read this again this time around, I realized that this is a wonderful book about vocation at mid-life. This is a far cry from What Color Is Your Parachute? Instead of searching desperately for the person you should become, Palmer urges us to be still and discover the person that you already are. Therein lies the wisdom for understanding vocation. I am tempted to start typing some of my favorite quotations from this book, but there are simply too many to choose. If you don’t know Let Your Life Speak, you should, and you should recommend it to anyone you know who is seeking their path and purpose in life. I have shared it with many people, and all have found it deeply insightful. The Stage is on Fire: A Memoir by Katie Steedly, self-published, 204 pp. I know Katie Steedly by way of her parents, who are members of my church. I met Katie when she moved back home to work on the 2008 presidential campaign for Barack Obama. We discovered immediately that we were easy conversation partners, and never had enough time to cover all the topics we began. So reading Katie’s memoir felt like continuing the conversation, hearing her take on the world and the unfolding of her journey to become herself. The Stage is on Fire is a series of reflections on the defining moments, decisions and awakenings that made her the person that she is. The book felt conversational, and the author’s style is frank, direct and revealing. Reading this book is like having a chat with a good girlfriend—laughing loud and long at life’s oddities, conferring over little choices, leaning in close when the sharing gets intimate. Except this girlfriend speaks (writes) in beautiful, considered prose, with a honed wit and eloquent syntax. It is one woman’s story of coming to terms with dating in her 30s, wrestling with health and body, owning her own debt, and navigating her own spirituality. Each chapter follows a similar design—recalling a particular incident or triumph or tragedy and how it formed her on the journey. She covers dating, running a marathon, living with a genetic disorder, teaching high school theater, and overcoming debt. Each one comes with a sense of humor and irony, depth and introspection, and always hope. I was also drawn (for obvious professional reasons) to the chapters about spirituality. Steedly is a child of the church, but takes a long journey to find her own path to the Spirit. She finds her way through yoga and through writing, among other things, but she always stays connected to the community of the church. 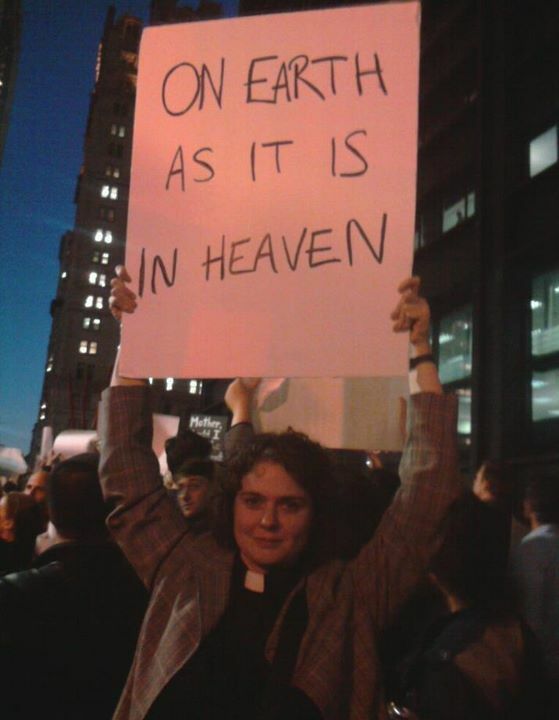 She understands something I have always believed: “Miracles happen in the basement of churches.” Amen! Way to make a pastor’s heart swoon. I thoroughly enjoyed reading The Stage is on Fire, and I think you will too. You can get a copy for yourself at www.katiesteedly.com. In recent months, I have been contemplating the slow transition into midlife. I’m not quite ready to claim the label yet (I’ll be turning 38 on my next birthday), but I’m definitely closer to midlife than to youth. It feels as though there is a subtle shift beginning in my perspective. All my life, I’ve been the youngest one. While I was the oldest child in my family, I was always the youngest in my class at school. My late-year birthday meant that I started kindergarten at four and completed my first semester of college at 17. When I went to seminary at 23, I had worked for two years after college, but I was still six years younger than anyone else in my seminary class. I was ordained at 27, and did not know any ministers younger than me at the time. Even now, there are no other pastors in my denomination’s local association that are younger than me. My closest age peer is five years my senior. In school and in ministry, in spite of my youth, I have done well. I am a quick learner, and I was able to keep up with my older classmates and coworkers. Part of my identity has always been this youthfulness, this sense of being somehow ahead for my age. Someone gave me the word for it: precocious. Being precocious has always been a part of what it means to be me. This year, I marked 10 years of ordained ministry, 14 years of marriage, and I’ll soon have five years of parenthood. I am no longer new at any of these things. It is no longer interesting (to me or anyone else) that I should be competent at them, in spite of my age. After so much time, it is expected that I should know what I am doing, that I should be effective at my work, that I should be responsible and put-together. While it still happens from time to time, it is increasingly rare to hear someone marvel that I am “already” the pastor of a church. For the most part, this is a great gift. After 10 years, it’s definitely old and perhaps also a bit insulting to have someone make over you for doing your job effectively. It is freeing to be normal, to have your competence no longer surprise people, to be treated with respect, and to be trusted as a knowledgeable leader. I no longer need to prove myself—people simply expect me to know what I’m doing. At the same time, there is a corner of my ego that wonders what will be special about me going forward. Youth made me unique for a long time (probably longer than most, since I entered a profession in which the average age is 51). Being a quick learner and enthusiastic adventurer will keep youthfulness around even longer, but not with the same level of surprise and intrigue. I am no longer precocious. That is a word that belongs only to youth. The question in my mind is: what will replace it? That’s been a fairly significant part of my identity for my entire life. While I’m ready to let it go, I found myself wondering what will take its place. Someone else gave me the word for that replacement: wisdom. Just as precocious is a term reserved for youth, wise is a descriptor that only comes with age. I’m definitely not ready to claim it yet. I’m not even sure it’s a term that can be claimed–perhaps it must be bestowed. I know it is a worthy aspiration. I aspire to be known as a wise woman, a wise leader, a wise pastor, or just simply wise. As I let go of the label “precocious” as part of my identity, I take comfort in thinking that “wise” might someday come to replace it. For now, I dwell in between. If I think about it, I guess I have gained some insight, even a modicum of wisdom from my years of experience. It’s also true that there is a glimpse of the precocious left from time to time, since there are still many things I am doing for the first time. I am no longer precocious, but not yet wise. I wonder how long this in-between time will last. 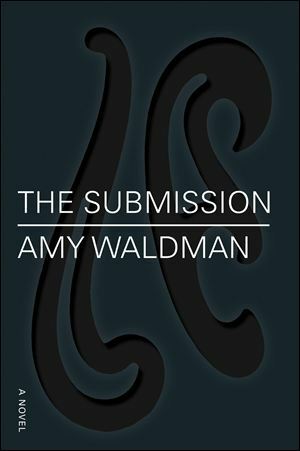 The Submission, by Amy Waldman, Farrar, Strauss and Giroux (New York), 2011, 299 pp. The Submission is a novel about 9/11. More particularly, it is a novel about the aftermath of 9/11 on the families of the victims, on New York, on Muslims, on politicians and the politics of the nation. It is startling how well Amy Waldman captures the tenor of our post-9/11 tensions. Sometimes, it’s hard to remember that this is fiction. The plot centers on the selection of a memorial for the World Trade Center site. A jury of artists and one elite 9/11 family member conduct a blind review of hundreds of submissions, and they settle on one called “The Garden.” When they gather to unveil the winner, they discover his name is Mohammed Kahn, an American Muslim. The jury immediately knows that the politics will be explosive, but they forge ahead. The 9/11 widow, Claire Burwell, had been the chief advocate for the design, but finds herself questioning Kahn and his design. Another group of family members, led by Sean Gallagher and joined by radical anti-Muslim advocates, organized against the memorial design. Things quickly get out of hand as talk radio pundits begin to claim The Garden is actually an Islamic garden, a martyrs’ paradise. The novel traces the interior struggles of each of the characters at the center of the debate. Claire Burwell, the sophisticated, wealthy 9/11 widow on the jury, slowly begins to doubt her judgment and yearns for a direct apology or explanation that Mohammed Kahn cannot give. Mohammed Kahn believes he should not be obligated to defend his work differently than a non-Muslim architect, and he struggles between stereotypes to present himself as both a sincere Muslim and an American, but appears to be neither. Sean Gallagher has made his life’s meaning out of honoring his firefighter brother’s memory, and his own grief and rage gets caught up in political forces beyond his grasp. Asma Anwar is an illegal Bangledeshi immigrant whose husband was also killed on 9/11, and she tries to find her voice in the fray. There are also bureaucrats and politicians, reporters and advocates and lawyers in the mix. I can’t say that I enjoyed this novel in the least–but that is not a statement about its quality. Amy Waldman does a compelling job of capturing the pain of racial and religious stereotyping, the sanctification of 9/11 victims, the hyperbolic media portrayals of controversy, and the national tension since 9/11. Consequently, reading the novel felt like watching the coverage of the latest scandal on television–it evoked the same frustration and helplessness, the same feeling of people talking past one another without ever listening or ever speaking from their hearts. I found this to be a hard story to read, because it covered material that is still raw and hard to experience. But I am grateful to Waldman for the time capsule of this novel, which will preserve this difficult experience for others in the future. 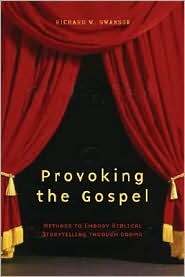 Provoking the Gospel: Methods to Embody Biblical Storytelling through Drama by Richard W. Swanson, Pilgrim Press, 2004, 136 pp. I purchased this book at the UCC General Synod this summer, and I had no idea how timely and helpful it would be. During the months of August and September, I preached a sermon series entitled “Living in Tents,” focused on the Hebrew Bible stories from Genesis and Exodus, loosely staying with the cycle of readings in the Revised Common Lectionary. Rather than attempt to read a large amount of text from the Bible, I used the children’s sermon time to engage in biblical storytelling about the narratives. I called it a “story for all ages,” and took 10-15 minutes to give a good, thorough telling of the biblical story, beginning with Joseph and moving on through the death of Moses this Sunday. I took some storytelling workshops way back in college, but I don’t really know much about the art of storytelling. Swanson’s book was a great way to engage me, as a beginner, in thinking about how to tell the scripture story in a new way, even though I did not follow his precise method (or even use the New Testament texts he highlights). He continues: “We need to poke these old stories, to poke them and provoke them a little. And nothing does that textual poking and provoking like public, physical performance.” (viii) This was definitely my experience in preparing to tell the story each week. Reading over the familiar stories with the intent to tell them drew my attention to the physical aspects in a new way. I had to imagine Pharoah’s stance and voice, put myself in the midst of each plague, respond to the burning bush. Learning to tell the story (instead of read it) put both me and the congregation in a different relationship to the characters in it. Provoking the Gospel is both a “why-to” and a “how-to” book—both making the case for biblical storytelling, and teaching the reader how to get started. Swanson’s method uses a group process, with an ensemble experimenting and engaging the story together. He incorporates theater exercises, body movement, experimentation and script-writing into his process. He encourages making mistakes, taking risks and getting it wrong along the path to provoking the surprising presence of God in these familiar Gospel stories. Each chapter contains a well-informed theoretical exploration for the “why-to,” followed by a list of exercises and steps for the “how-to.” Although I did not follow these instructions, I still found the exercises helpful in beginning the process as a solo storyteller. Both Swanson and the process of doing storytelling in my congregation have convinced me that we should be making this a part of our worship and teaching on a regular basis. If we want an embodied, vital life of faith, we need to share with people an embodied, vital version of the Gospel. Storytelling is what God’s people have always done to share the good news. It’s what Jesus did to share his message. We need to follow their example and tell the stories over and over again in new ways.